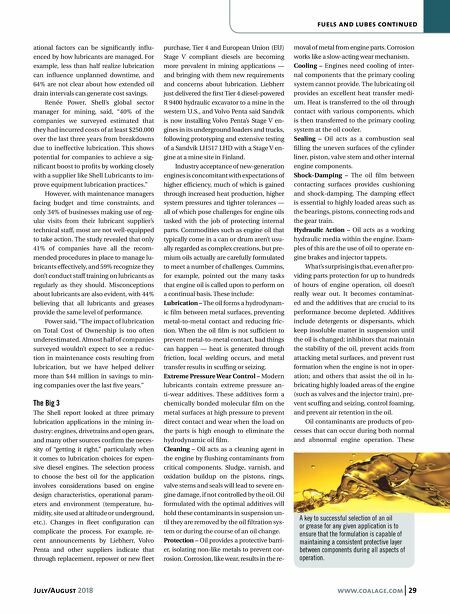 July/August 2018 www.coalage.com 29 fuels and lubes continued ational factors can be significantly influ- enced by how lubricants are managed. For example, less than half realize lubrication can influence unplanned downtime, and 64% are not clear about how extended oil drain intervals can generate cost savings. Renée Power, Shell's global sector manager for mining, said, "40% of the companies we surveyed estimated that they had incurred costs of at least $250,000 over the last three years from breakdowns due to ineffective lubrication. This shows potential for companies to achieve a sig- nificant boost to profits by working closely with a supplier like Shell Lubricants to im- prove equipment lubrication practices." However, with maintenance managers facing budget and time constraints, and only 34% of businesses making use of reg- ular visits from their lubricant supplier's technical staff, most are not well-equipped to take action. The study revealed that only 41% of companies have all the recom- mended procedures in place to manage lu- bricants effectively, and 59% recognize they don't conduct staff training on lubricants as regularly as they should. Misconceptions about lubricants are also evident, with 44% believing that all lubricants and greases provide the same level of performance. Power said, "The impact of lubrication on Total Cost of Ownership is too often underestimated. Almost half of companies surveyed wouldn't expect to see a reduc- tion in maintenance costs resulting from lubrication, but we have helped deliver more than $44 million in savings to min- ing companies over the last five years." The Big 3 The Shell report looked at three primary lubrication applications in the mining in- dustry: engines, drivetrains and open gears, and many other sources confirm the neces- sity of "getting it right," particularly when it comes to lubrication choices for expen- sive diesel engines. The selection process to choose the best oil for the application involves considerations based on engine design characteristics, operational param- eters and environment (temperature, hu- midity, site used at altitude or underground, etc.). Changes in fleet configuration can complicate the process. 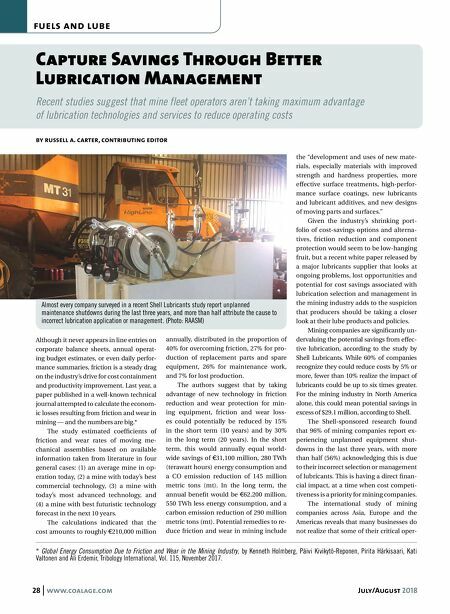 For example, re- cent announcements by Liebherr, Volvo Penta and other suppliers indicate that through replacement, repower or new fleet purchase, Tier 4 and European Union (EU) Stage V compliant diesels are becoming more prevalent in mining applications — and bringing with them new requirements and concerns about lubrication. Liebherr just delivered the first Tier 4 diesel-powered R 9400 hydraulic excavator to a mine in the western U.S., and Volvo Penta said Sandvik is now installing Volvo Penta's Stage V en- gines in its underground loaders and trucks, following prototyping and extensive testing of a Sandvik LH517 LHD with a Stage V en- gine at a mine site in Finland. Industry acceptance of new-generation engines is concomitant with expectations of higher efficiency, much of which is gained through increased heat production, higher system pressures and tighter tolerances — all of which pose challenges for engine oils tasked with the job of protecting internal parts. Commodities such as engine oil that typically come in a can or drum aren't usu- ally regarded as complex creations, but pre- mium oils actually are carefully formulated to meet a number of challenges. Cummins, for example, pointed out the many tasks that engine oil is called upon to perform on a continual basis. These include: Lubrication – The oil forms a hydrodynam- ic film between metal surfaces, preventing metal-to-metal contact and reducing fric- tion. When the oil film is not sufficient to prevent metal-to-metal contact, bad things can happen — heat is generated through friction, local welding occurs, and metal transfer results in scuffing or seizing. Extreme Pressure Wear Control – Modern lubricants contain extreme pressure an- ti-wear additives. These additives form a chemically bonded molecular film on the metal surfaces at high pressure to prevent direct contact and wear when the load on the parts is high enough to eliminate the hydrodynamic oil film. Cleaning – Oil acts as a cleaning agent in the engine by flushing contaminants from critical components. Sludge, varnish, and oxidation buildup on the pistons, rings, valve stems and seals will lead to severe en- gine damage, if not controlled by the oil. Oil formulated with the optimal additives will hold these contaminants in suspension un- til they are removed by the oil filtration sys- tem or during the course of an oil change. Protection – Oil provides a protective barri- er, isolating non-like metals to prevent cor- rosion. Corrosion, like wear, results in the re- moval of metal from engine parts. Corrosion works like a slow-acting wear mechanism. Cooling – Engines need cooling of inter- nal components that the primary cooling system cannot provide. The lubricating oil provides an excellent heat transfer medi- um. Heat is transferred to the oil through contact with various components, which is then transferred to the primary cooling system at the oil cooler. Sealing – Oil acts as a combustion seal filling the uneven surfaces of the cylinder liner, piston, valve stem and other internal engine components. Shock-Damping – The oil film between contacting surfaces provides cushioning and shock-damping. The damping effect is essential to highly loaded areas such as the bearings, pistons, connecting rods and the gear train. Hydraulic Action – Oil acts as a working hydraulic media within the engine. Exam- ples of this are the use of oil to operate en- gine brakes and injector tappets. What's surprising is that, even after pro- viding parts protection for up to hundreds of hours of engine operation, oil doesn't really wear out. It becomes contaminat- ed and the additives that are crucial to its performance become depleted. Additives include detergents or dispersants, which keep insoluble matter in suspension until the oil is changed; inhibitors that maintain the stability of the oil, prevent acids from attacking metal surfaces, and prevent rust formation when the engine is not in oper- ation; and others that assist the oil in lu- bricating highly loaded areas of the engine (such as valves and the injector train), pre- vent scuffing and seizing, control foaming, and prevent air retention in the oil. Oil contaminants are products of pro- cesses that can occur during both normal and abnormal engine operation. These A key to successful selection of an oil or grease for any given application is to ensure that the formulation is capable of maintaining a consistent protective layer between components during all aspects of operation.